We would just like to update our followers that we are currently experiencing a horrendously high volume of calls from people reporting strays and wanting to rehouse their cats. We are currently full to capacity and will try and help as much as we can. We have experienced a few abusive phone calls recently from the public, so would just like to remind everyone exactly what we are up against. We receive approx 15 - 20 calls a day and the same in email enquiries from people reporting strays and wanting help in homing their cats, we only have a limited number of pens and limited volunteers, so please do bear with us. It's very distressing for us to be aware of so much suffering and not have the volunteers and resources needed. If you are aware of a stray, you can help us by initially getting the cat to a vet to be checked for a microchip and emailing details to helencatsprotection@yahoo.co.uk, along with posting or inboxing our facebook admin. Thanks for understanding. From spring through to late autumn, literally thousands of kittens (and their mums) come into rescue shelters across the UK. Sometimes they are taken in when a stray cat has had kittens outside, but all too often it is where unthinking owners have simply not bothered to have their cat neutered, and then find themselves with an unplanned, unwanted litter. There are already far too many cats in rescue shelters up and down the country, and not enough homes to go round. There are 21,000 reasons why you should get your cat neutered - because that's potentially how many offspring could result from one un-neutered female cat and her descendants in just seven years! There is a cat over-population crisis in the UK today! For many people, neutering their pets is simply too expensive, but DON'T PANIC - help is at hand! 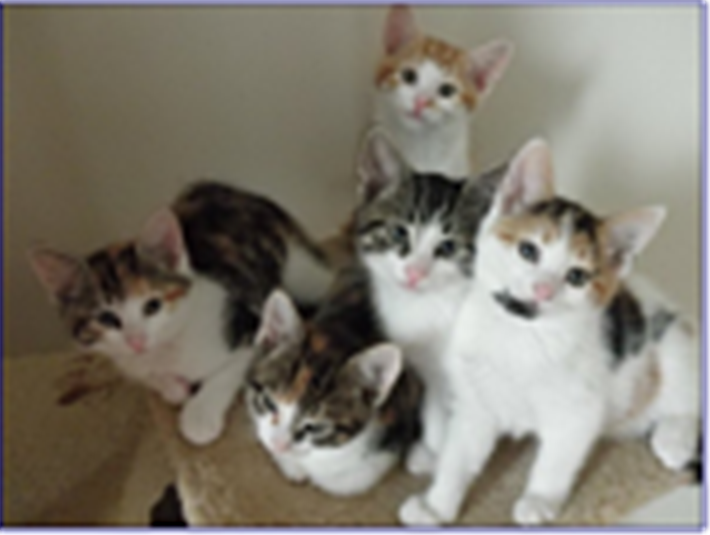 Please email us at helencatsprotection@yahoo.co.uk for more information. If you are thinking of adopting a rescue cat or have recently adopted one of our feline friends, then please bear in mind just how difficult a life these stray and and abandoned animals have had. When the cats first come into care they are often very scared, unsure of humans and it takes them a while to adapt to their new surroundings. Cats on the whole don't like change! When rescue cats are adopted and go to new homes they often become very scared again and may hide, become defensive or show some signs of aggression. This is the cats way of telling you they are afraid. Remember that this is a very unsettling experience for your cat and they will need time to adapt and get used to their new life. This may take a day or so or even a few weeks depending upon the cat. Just like people, they are all different. It's often best to leave your new cat alone when they first come home. Show it where its food, water and litter tray is and then leave puss to come round in its own time. Although you may feel like stroking and cuddling puss, remember that they don't know you yet, and have found themselves in a strange and scary place. Puss will let you know when they are feeling more safe and confident. Unlike people, you can't tell a cat what is happening, they will need time to get to know and trust you. Please give your cat a chance and be patient, don't panic and feel that the cat isn't right for you after all. Asking us to take the cat back into care is not only extremely upsetting for puss but also for our fosterers who give a lot of their time, love and energy in caring for these cats. By choosing to adopt a rescue cat you are doing a wonderful thing! 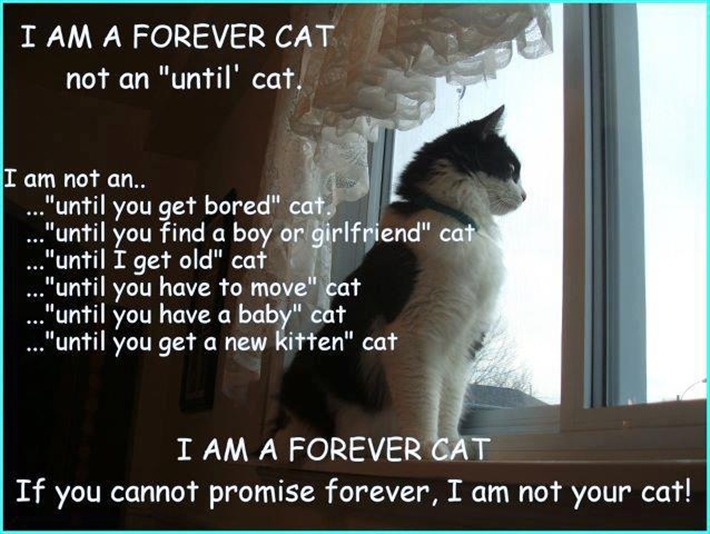 You are giving an abandoned, stray animal the chance of a new, happy life which is what every single one of our rescue cats deserve - don't give up on them! If you would like to talk to us about settling your cat in its new home, then please contact us.